1. If you are new to Bauce, like our Facebook page or follow us on twitter. This will keep you up to date on all the fab stuff we’re doing here. Facebook: https://www.facebook.com/BauceMag or Twitter: https://twitter.com/BauceMag. 2. Leave a comment on our site. Make sure to include your real email address so that way we can track you down if you are selected. Each comment you leave counts as one entry. You may enter as much as you like. 3. Share your favorite content from our site. Use social media, such as Facebook, Twitter, Pintrest, G+ etc to share your favorite reads from Bauce Magazine. Each share counts as an entry into the contest. We’ll be keeping track! 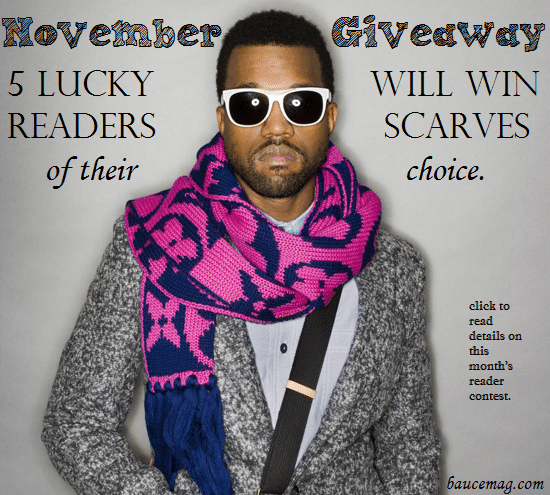 Contest ends November 30 and winners will be announced in the month of December. What are you waiting for? Start spreading the word about your new favorite online magazine, Bauce.